Dr. Gabriel Rabinovich was awarded with the most prestigious science award in Argentina, Best Researcher in Argentina 2016. The 7th of December 2017, President Mauricio Macri named Dr. Rabinovich the Best Researcher of 2016, as a result of his life achievements and continuous dedication to the study of galectins and glycans in autoimmune pathologies, cancer and infection diseases. 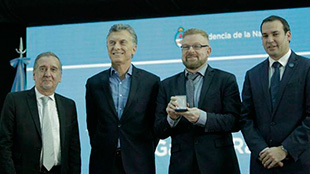 President Macri emphasized that this prize contemplated both the importance of Dr. Rabinovich´s basic research as well as the relevance of his discoveries to improve human health.